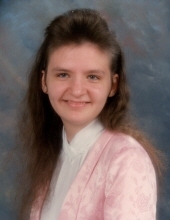 Denise Van Winkle, age 44, passed away Saturday, December 1st, 2018 at the Bluegrass Hospice Care Center in Lexington, KY. She was born April 7th, 1974 in Berea, KY to Bonnie Lou Eversole Van Winkle and the late William Earl Van Winkle. Denise was of the Holiness faith and loved to attend church at the 1016 Holiness, Bobtown Holiness and Big Hill Holiness Churches. She also enjoyed listening to gospel music, going to Tennessee and girls shopping days. Other than her mother she is survived by her sister, Sandy Lou Hatton and her husband Anthony of McKee, KY her Niece, Faith Hatton and Nephew Sean Hatton both of McKee, KY. Several aunts, uncles, cousins, and friends also survive. Funeral services will be 1:00 PM Wednesday, December 5th, 2018 at the 1016 Holiness Church with Rev. Leonard Wilder, Rev. Stevie Isaacs, and Rev. David Rose officiating. Burial will follow in the Norris Cemetery in Waneta. Visitation will be 5-9 PM Tuesday at the church. Davis & Powell Funeral Home in charge of arrangements. To send flowers or a remembrance gift to the family of Sallie Denise Van Winkle, please visit our Tribute Store. "Email Address" would like to share the life celebration of Sallie Denise Van Winkle. Click on the "link" to go to share a favorite memory or leave a condolence message for the family.